Motorola DROID an iPhone Challenger? These price trackers are updated every month. PR: Jing Li, a physical scientist at NASA's Ames Research Center, Moffett Field, Calif., along with other researchers working under the Cell-All program in the Department of Homeland Security's Science and Technology Directorate, developed a proof of concept of new technology that would bring compact, low-cost, low-power, high-speed nanosensor-based chemical sensing capabilities to cell phones. The device Li developed is about the size of a postage stamp and is designed to be plugged in to an iPhone to collect, process, and transmit sensor data. The new device is able to detect and identify low concentrations of airborne ammonia, chlorine gas, and methane. The device senses chemicals in the air using a "sample jet" and a multiple-channel silicon-based sensing chip, which consists of 16 nanosensors, and sends detection data to another phone or a computer via telephone communication network or WiFi. The Times' Peter Knight says that with its 12.1-megapixel camera and sleek touchscreen, the Sony Ericsson Satio is one of the most desirable mobile phones you could buy this Christmas- but the Satio is one of the highest emitters of low-level radio waves on the mobile phone market. "[In] the preliminary findings of the Interphone study, the biggest of its kind . . . conducted under the auspices of the World Health Organisation (WHO) and its conclusions will be drawn from research by scientists in 13 countries . . . some of the evidence from the 12 countries that have published their reports seems to suggest that there is 'significantly increased risk' of developing some types of brain tumour if you use a phone for a decade or more. But this conflicts with the findings from other countries taking part in the study, including the UK; the WHO is expected to compile a definitive conclusion in the coming weeks. However, a US-Korean study in the Journal of Clinical Oncology last month concluded that there is possible evidence linking mobile phones to the risk of brain tumours...."
Link: Is Your Mobile Phone Bad for You? "With the DROID, the company has perhaps created its most attractive and intriguing piece of technology yet. Forging an alliance with both Verizon and Google, Motorola has come up with a second compelling reason to count the phonemaker down, but certainly not out, while the other two giants have finally found a seemingly worthy device to position against the iPhone. So . . . is this the phone which will catapult Android into the mainstream? Is it the device that will pull Motorola back from the brink?" InfoWorld's Galen Gruman says that the latest Android 2.0-based "iPhone killer" won't kill the iPhone or the BlackBerry - and the cheaper HTC Droid Eris is the new smartphone that he thinks Apple should be concerned about. But there are now six smartphones on the market that will appeal to business and professional users, each with different strengths and weaknesses. This article gives InfoWorld's ratings for all six - the Apple iPhone, HTC Droid Eris, Motorola Droid, Palm Pre, Research in Motion BlackBerry Bold, and RIM BlackBerry Storm 2 - plus an interactive ratings form in which you can enter your own weighting for each category in InfoWorld's exclusive Mobile Deathmatch Calculator and get a customized score for each smartphone. "Of all the many apps, these are some of the most all-around helpful tools that every photographer should have in their arsenal. Tell us what's in your iPhone 'photo bag' in the comments." 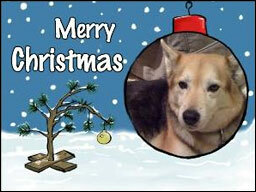 PR: Christmas during a recession has people opting to use helloCards version 1.3.3 to send Holiday greetings this year. Due to the economy, it may be the only way that some busy and broke families can afford it. The high cost of printed cards and postage rules out the traditional method. helloCards is an iPhone and iPod touch app with a databank of 200 stock cards. They have something for every occasion. Holiday season may be better financially than last year but many are still feeling the economic restraints. Luxury items, such as the traditional Christmas card mailing is out of the question for people who are busy trying to make ends meet. As a viable alternative, they are turning to inexpensive ways to send seasonal wishes, with helloCards topping the list as number one choice. While the recession may be easing up, it's not over. Nor are the far reaching effects that it's had on the working class, who represent the majority of the population. Some may be able to afford a little more for loved ones this Christmas, however things have not bounced back enough yet for many of the traditional extras that add to the season. For that reason, the sending of cards via iPhone and iPod touch apps has become extremely popular over the past year, with helloCards leading the pack. People appreciate paying a low, one-time fee of $1.99 to be able to send personalized Christmas cards to everyone on their list. The climb in market share for helloCards isn't just about price. With everyone finding less and less time for themselves and their families, it is also a fast alternative to handwriting cards and envelopes, applying stamps and going to the post office. People are able to personalize the helloCards with text and stock images or their own embedded photos quickly and easily, which is a huge selling feature. Once the card is made, it is sent to the recipient's inbox via the built-in email application. To sample this product, there is a free version for people to try, called helloCards Lite. It works the same as the full app but has a smaller card library. helloCards is an iPhone and iPod touch app with a databank of 200 stock cards. They have something for every occasion. To customize the greetings, personal text and images can be embedded very quickly and easily. There are no usage limits on helloCards, they can be sent everyday, all day long. The $1.99 price tag is all you need to pay, nothing is extra. helloCards 1.3.3 is $1.99 and available worldwide exclusively through the App Store in the Social Networking category. Promo codes are available for qualified reviewers. Please specify the website or blog you represent when making your request. Just over one year ago, we unveiled Google Earth for the iPhone and iPod touch. Google Earth quickly became one of the most popular applications in the App Store, and after only six months, was the second most-downloaded free application overall. A big thank-you to the over 220,000 users have taken the time to write a review! Today, we're proud to announce version 2.0 of Google Earth for iPhone. We've added some exciting new features, including the ability to view maps that you create on your desktop computer right from your iPhone, explore the app in new languages, and improved icon selection and performance. Have you ever wanted to view a custom map with Google Earth on your iPhone? Well, now you can. By logging in directly to your Google Maps account, you can view the same maps that you or others have created, using the My Maps interface. Maybe you're on a trip and want to see where Tony Wheeler, the cofounder of Lonely Planet, most likes to travel. Or perhaps you're walking around looking for a restaurant and you want to see where world-famous chef Ferran Adri likes to eat. All you have to do is click "Save to My Maps", open Earth on the iPhone, log in with the same account information, and voilà, you have your same collection of My Maps right in your pocket. It's fun to create and view your own maps as well. Here's an example of a map that I created that shows the two attempts my friends and I made to summit Mount Ritter in the Sierra Nevada mountain range. As you can see, we didn't quite make it (the red line is the intended route, and the blue and green lines are our 2008 and 2009 attempts, respectively). Next year we'll get it for sure! I created this map by using the desktop version of Google Earth to read the tracks directly out of my GPS device, saving the resulting tracks as a KML file, and then importing into My Maps in Google Maps. You can learn more about My Maps here. Browsing the world from the palm of your hand can be a thrilling experience, and viewing photos, Wikipedia articles, and place information is a great way to discover new parts of the globe. With the latest version of Google Earth for iPhone, we've made this even easier. Now, when you touch an icon, a small glow appears under your finger to let you know which icon you have picked. If your finger touches more than one icon, you'll be taken to a list of all icons, so you can select the one you are interested in. We've also included new languages in this release, bringing the total to 31 languages from the original 18. The complete list of languages is: English (US), English (UK), French (France), German, Traditional Chinese, Simplified Chinese, Dutch, Italian, Spanish, Portuguese (Brazil), Portuguese (Portugal), Danish, Swedish, Finnish, Norwegian, Korean, Japanese, Russian, Polish, Turkish, Ukrainian, Arabic, Thai, Czech, Greek, Hebrew, Indonesian, Malaysian, Romanian, Slovak, and Croatian. We hope you enjoy our latest release. Please note that the app will be rolling out around the world over the next twenty-four hours - if you don't see it immediately, be sure to check back soon. PR: TapMode announces Battery Gauge 1.0 for iPhone and iPod touch. Battery Gauge takes into account all of a user's normal iPhone or iPod touch activities. Each task uses a different amount of charge and Battery Gauge intuitively figures it out. Battery Gauge knows how long an individual needs for each task and gives accurate estimates on whether or not the user has enough charge left to complete them. TapMode president, Jeff McMorris, recently launched a new iPhone/iPod touch app that learns a user's patterns and intuitively keeps track of projected battery usage required to carry out tasks. Released to iTunes, Battery Gauge is the first of its kind. McMorris came up with the idea for Battery Gauge in order to solve a problem in his own life. "I needed an app that would give me an idea of the actual time I had remaining on my battery, that would look at how I used my phone and then base its estimate on that usage pattern." Battery Gauge differs from other apps that are similar in nature. While the others can only give you an estimate of how much time is remaining in your battery for a single activity, McMorris' app is all encompassing, taking into account all of a user's normal iPhone or iPod touch activities. Each task uses a different amount of charge and Battery Gauge intuitively figures it out. As most people use their handheld devices for a number of different things, this program is likely to become indispensable to the masses. The Battery Gauge app has a nicely designed user interface and works with any version of iPhone or iPod touch. Battery Gauge is the first intuitive iPhone and iPod touch app to work with your battery charge. As it learns your patterns and notes which tasks you perform and how long they take, you'll always know whether or not you have enough battery life to complete activities. Don't get left hanging in the middle of an email or download with a dead handheld device. Battery Gauge 1.0 is 99¢ and available worldwide exclusively through the App Store in the Utilities category. Promo codes are available for qualified reviewers. Please specify the website or blog you represent when making your request. PR: Appscout reports that Car and Driver has unveiled a free Buyer's Guide app for the iPhone and iPod touch. The app includes the magazine's full 2010 Buyer's Guide, which features overviews, pricing, specs, photos, and a list of competitors for each make and model of car. The free app is available now in Apple's App Store. This friendly application will save you a lot of time: no more switching among different applications just to consult your shopping or to-do list, book and CD lists, to write your diary, record audio notes, read files, record the time of your exercises, etc. Plus, AlliDator will save that precious iPhone screen estate: only one icon instead of dozens. AlliDator is a true multimedia database. You will be able to use the hardware capabilities of your device to enter multimedia or location data in AlliDator (even video on iPhone 3GS). Imagine the possibility of recording the name and photo of a nice restaurant, together with its geographical location, and a voice note about its best dishes, all with a few taps, in a single application! AlliDator is perfectly integrated with all the native iPhone functions, so that you will be able to make a phone call or send a mail to a contact, open a Web address, visualize a map, put into your records a video or a photo from the photo roll or library, a contact from the address book, etc. And with our innovative tap-and-do interface you can even choose the action to trigger when you tap a record. The AlliDator engine is based on powerful relational database technologies, but you will be shielded from the complexity of such technologies with a simple and intuitive interface, in the pure iPhone OS style, and will be able to use even the new powerful "free data set", to organize your data in your own way, without rigid schemas of fixed fields. Both of course! A set of fully customizable templates is preloaded on AlliDator, and, more importantly, you will find many more of them in our web site for free, ready to be used with just a click! But you can create in a moment a new data set to suit your needs. Plus, you could load a spreadsheet typed in your computer as a new data set. How convenient! For added security, the access to your data can be protected with a password, and, when a WiFi connection is available, you can backup all your data on any computer with a web browser, and also exchange documents, images, audio and video between AlliDator and the computer. And, when a WiFi connection is not available, you will be able to use in-application e-mail to share one of your documents or multimedia data. PR: MyWebGrocer and ShopRite supermarkets have teamed up to launch a pioneering new Apple iPhone and iTouch Application called ShopRite Weekly Specials. The new App, which is free and available now through Apple's iTunes App Store, is the first App that is dedicated to weekly grocery specials on an iPhone. MyWebGrocer and ShopRite supermarkets have teamed up to launch a pioneering new Apple iPhone and iTouch Application called ShopRite Weekly Specials. The new App, which is free and available now through Apple's iTunes App Store, is the first App that is dedicated to weekly grocery specials on an iPhone. ShopRite's user-friendly App is intuitive and makes shopping more accessible - whenever, wherever. The App is the latest incarnation of MyWebGrocer's efforts to make ShopRite's customers' lives easier. It functions as a portable circular and invites consumers to "start saving" before they even arrive at the store by browsing hundreds of items instantly. Among its many groundbreaking features, ShopRite Weekly Specials enables consumers to see what's on sale in real time at their regular ShopRite store. Once they select an item, it literally tumbles into their shopping list, which is neatly organized by category with pictures, descriptions and real time prices. The App synchs and downloads store specials directly to an iPhone or iPod touch and can even sync with customers' shopping lists at ShopRite.com. We want to do everything we can to enhance the customer experience at ShopRite and the iPhone App is a mobile extension of those efforts. Working with an innovator like MyWebGrocer is a big part of retaining our current customers and acquiring new ones. "We're deeply committed to our customers, and their lives are headed more and more digital every day," explains ShopRite SVP of Marketing Cheryl Williams. "This new App not only helps our customers save money, but more important, it makes their lives a little bit easier. We want to do everything we can to enhance the customer experience at ShopRite and the iPhone App is a mobile extension of those efforts. Working with an innovator like MyWebGrocer is a big part of retaining our current customers and acquiring new ones." MyWebGrocer CEO Rich Tarrant echoed those sentiments. "This new App represents a logical and natural progression of our partnership with ShopRite, taking traditional shopping tools and evolving them to the digital space. It all centers around our commitment to bringing unique and thoughtful solutions to our clients that help them connect with their customers." The new ShopRite Weekly Specials App is available now as a free download on the iTunes App store. PR: Happymagenta announces Spyglass 1.2, an update to their popular digital compass and HUD display for iPhone 3GS devices. Developed specifically to leverage the iPhone's unique capabilities, Spyglass turns any 3GS iPhone into a real-time digital spyglass and heads-up display with a live compass, GPS information, as well as tilt horizon - right over the live feed from the built-in camera or even an auto-rotated map. Spyglass is a fun-to-use augmented reality tool. Just like in airplanes, sci-fi movies or military-styled night vision binoculars, Spyglass works in any orientation encompassing a three-dimensional space. While viewing through the iPhone's built-in camera, tilt or rotate the device to see incredibly detailed, live information in any direction. All Spyglass features, such as digital zoom (up to 5x), color filters, HUD colors and imperial or metric units are easily configurable. "The idea behind Spyglass was initially to create a fun as well as useful tool similar to binoculars that are commonly used in sci-fi, military and action movies.," said Pavel Ahafonau, founder and CEO of Happymagenta. "However given the great response, we decided to develop it further by adding a styled compass over live, automatically rotating maps. We even have other features planned for future releases." 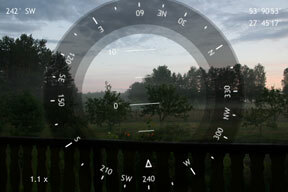 Version 1.2 adds auto-rotation maps and new overlay filters for cool, night vision styled military effects. 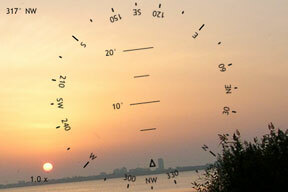 When in compass mode, the heads-up display is shown over satellite maps that automatically rotates as the user moves along. When maps are enabled (using the Info screen), the GPS coordinates are shown in real-time. When maps are disabled no Internet access is needed. As well as a fun-to-use novelty app, Spyglass can also serve as a useful tool during hunting, fishing or other sports related activities. Spyglass 1.2 is 99¢ and available worldwide exclusively through the App Store in the Navigation category. Review copies are available upon request. PR: CatPaint is the premier [only? Ed.] 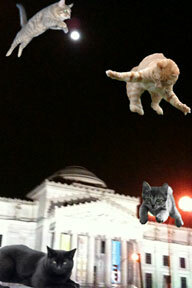 cat-based image editor for the iPhone and iPod touch - an immersive and multi-sensory experience, wherein you can put adorable cats on top of your photos. Also, they mew. 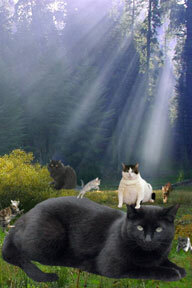 With just a few touches, you can take a photo, cover it with cats, and send it off to your friends and family. To get started, simply pull out the litter-box drawer to select a kitty, then tap anywhere to place it. Should you misplace a kitten, just gently shake your iPhone or iPod touch like an Etch-a-Sketch to Undo. Shake a little and one cat will disappear, shake a bunch and clear all the cats and start again. Download it now at the iTunes App Store. PR: Freeverse has released the first update to its helpful iPhone and iPod touch magnifying app, Eye Glasses. The app will now feature a new, sleeker frame with capability to rotate between landscape and portrait modes. Whether tackling a menu in a dimly lit restaurant, struggling with the directions on a prescription bottle or fighting the urge to reach for those pesky specs constantly, Eye Glasses provides the perfect tool to tactfully navigate any magnifying challenges in your everyday life. Eye Glasses utilizes the auto-focusing elements of the iPhone 3G S camera to help users zoom in on hard to read text or small images. For added ease, users can choose from four different magnification levels with the help of their device's camera. Eye Glasses is an ideal app for senior citizens, those who rely on bifocals or reading glasses and farsighted folks who want to not only see more clearly, but who also keep up with latest in iPhone technology. Eye Glasses is now available in the Apple App Store for $2.99. PR: Know an iPhone enthusiast? PowerBookMedic'a got the perfect thing... Mac Jewelry. Perfect for the Mac enthusiast on your list, these unique earrings are exclusive to PowerbookMedic and are made with real iPhone home buttons. Show off your Mac or iPhone enthusiasm in style. Orders placed will ship on Nov 19th - Nov 20th due to very high demand. PR: Appstand for iPhone 3G & 3GS is here! Simply slide your iPhone into Appstand to get the most out of the tens of thousands of Apps available. With full access to button controls and ports, charging while in Appstand is effortless using the cord you already own. The Personal modes are great for using or viewing various Apps when Appstand is placed right in front of you on a tabletop or desktop. It s perfect for surfing the web, viewing videos at your desk, having a conference call, etc. When designing Appstand, it was extremely important to make sure that the functionality of your iPhone was completely unrestricted. Therefore all of the ports and buttons are totally accessible including the touchscreen. Appstand was designed specifically to allow you to charge your iPhone with the cord that you already own. And since there is no wrong way to place your iPhone into Appstand, charging is never a problem. Since the window on Appstand exposes the entire iPhone face including the proximity sensor, answering your call is as easy as touching the screen. And with the speaker function activated, handsfree calls have never been so seamless. If you would rather hold the phone to your ears, Appstand was designed so that you can easily slide your iPhone out to use at a moment's notice. Appstand is only available in black, however, if you wish to add a splash of vibrant color, Appmats are the perfect solution. Appmats slide right into Appstand to change the color or design of the inner layer of the Appstand frame. Currently, a 3-pack of Appmats (various colors) is available for purchase. Stay tuned for additional colors, designs, and packs of Appmats. PR: The Cradle fits the iPod touch like a stylish case, adding only 0.37 to its thickness. But this slim, lightweight device has a lot more to offer than meets the eye. Rechargeable Battery powers GPS or recharges iPod. LED indicator shows battery level. Use the Cradle with the included NavAtlas app and turn your iPod touch into a fully-featured GPS navigator with real-time, voice prompted turn-by-turn directions. Ditch the mainstream and step into the future with Dual Electronics 200-watt mechless AM/FM in-dash Docking Station for iPod and iPhone devices. Securely dock your iPhone or iPod in the dashboard of your car, enjoy the convenience of a "control center" that is right in front of you for easy and quick access from arm's length and switch easily and safely from iPod to AM/FM mode and the touch of a finger. If you own an iPod touch or an iPhone, you can now safely enjoy all the cool apps in the car - from listening to Internet radio through car speakers while navigating to a destination and exploring an area for places of interest, to locating the best deal on gas, checking movie schedules in the nearest theaters and finding a restaurant for dinner. You don't need a separate windshield mount, and you won't drain your batteries. And if you just want to listen to your favorite tunes or audio books from your iPod player, the Docking Station lets you do so safely and easily. It provides a "home" for your iPod in your car, and you can browse your playlists and choose music directly from your iPod menu using the familiar iPod scroll wheel. So check your CDs at the door, as only iPods and iPhones need apply. Stay tuned for news about upcoming accessories for the Docking Station such as apps, a GPS Receiver and a Memory Storage Module with arecording feature that allows you to record music you are listening to on the radio. Enjoy Music. - Listen to your iPod tunes or to Internet radio via free apps like PandoraRadio or iheart radio - all through your car speakers. Be Safe. - Use our EZ Control app (coming soon) for simplified and safer operation of your iPod at arm's length. Get there stress- free. - Take control of your commute with the Traffic.com free app, and turn your docked iPhone into a GPS navigation device with apps such as MotionX GPS Drive, G-Map or MobileNavigator, which will guide you with turn-by-turn spoken directions. Find things. - WHERE, Urbanspoon, Cheap Gas!, Yelp and other great apps can easily help you find what you are looking for while driving. Listen and learn. - Listen to your favorite podcasts or to audio books with apps such as Audiobooks and iLibrary + Audio. They'll make the ride go faster. Please refer to requirements and compatibility statements for each app, as specified in the iTunes App Store. The BTM60 clips to your sun visor and connects to your receiver with a single cable for easy setup. Once it's installed, just press the interface's talk switch when you get a call. 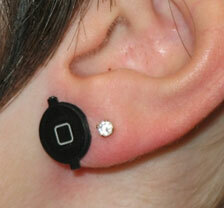 You can also stream audio from cell phones that transmit music files. Note: Compatibility of this device may vary, depending on your phone. 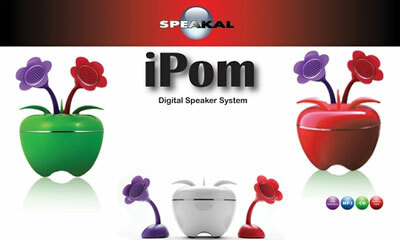 PR: Speakal launches the new and trendy iPom with two flower-shaped speakers and a rocking 12 Watts subwoofer. "With the markets focusing primarily on delivering music through iPod, iPhone, and MP3 players, the iPom offers a new solution for the consumer who stores music on USB drives or SD cards," said David Solomon - CEO. The new eco-friendly apple shaped iPom speaker comes in 3 different vibrant colors - White, Red and Green- with two detachable flower-shaped speakers. 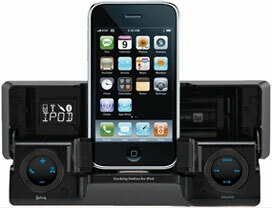 It allows you to enjoy music from a variety of media such as USB flash drives, MMC/SD cards and from any other music source that connects through a 3.5 mm input jack such as iPod, MP3 players, Zune, CD players, computers, or gaming consoles. "We are pleased to launch the new iPom before the Holiday Season. With its unique visual appeal, the iPom delivers a truly remarkable sound experience," added Mr. Solomon. The consumer can easily dock the flower speakers on top of the apple or enjoy a sound surround effect by having one or both speakers docked separately in their pots and positioned in different angles. Priced at $99.99 the iPom is available at www.Speakal.com and through authorized retailers and e-tailers in the U.S.A. and Canada. The iPom comes in three vibrant colors that complement your home office, bedroom, dorm room, or home décor and that brings in new vivid looks. The iPom has a bass reflex technology and an air flow optimized design to consistently deliver a constant outstanding sound. The user can place the flower shaped speakers in various positions and angles depending on their taste and still enjoy a 360 degree sound surround effect too. The consumer can play music from USB flash drives, MMC/SD cards or from any audio or gaming device that has a 3.5 mm jack such as iPod, iPhone, MP3 players, Zune, Wii, PS3 etc. The different controls on the apple shaped speaker allow the user to amplify or reduce the volume, play or pause the music, or select the desired track by gently touching the appropriate control. PR: A great way to keep scratches and marks off your electronics. Made with 2 layers of wool blend felt and bonded with Eco-Glue an environmentally safe non toxic adhesive made with no animal derivatives or hazardous pollutants. Good for the environment and you! A full color photo is printed on high quality 200 thread count 100% pure cotton photo fabric. Image is then adhered with heavy duty adhesive to quality wool/acrylic blend felt and then treated to resists stains and fraying. The front has a clear vinyl portion bonded and stitched in that has a cut slit to insert your own image, image size should be aprox 1.5" x 1.75" for optimal fit. Back is solid silver/gray felt as well as inside. Item is hand cut and hand stitched. Comes carded and sealed in plastic ready to gift. PR: Marware Inc. announces that the EcoSleeve for the iPod nano 5G is now shipping. 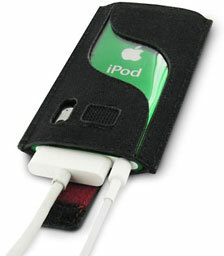 An environmentally friendly solution, the EcoSleeve for iPod nano 5G protects your iPod with a custom fit. A thin bottom flap secures the nano and keeps the docking port covered and away from dust or dirt. Open the flap and you can sync or charge right in the case. The wave styling in the back of the case shows off your nano colors. Eco-Fabric, soft stitching and recycled fleece interior round out the appeal and environmental friendliness of this little sleeve. 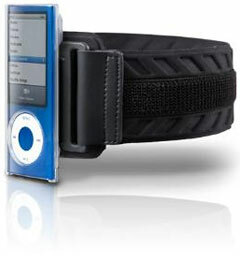 The EcoSleeve for iPod nano 5G also comes with Marware's Lifetime Warranty. The EcoSleeve for the Pod nano 5G is available in black Eco-Fabric. It retails for $19.99 USD and is shipping now. Visit Marware online for more information. 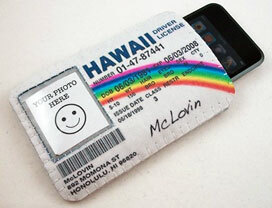 Marware is a leading provider of software and eco-conscious accessory solutions for Apple iPhones, iPods, and Notebooks. 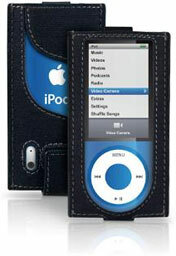 You can order Marware iPod cases through Low End Mac's Amazon.com store. PR: Marware today announce its thinnest case to date, the MicroShell for iPod touch 2G is now shipping. 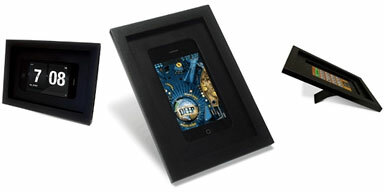 The MicroShell for iPod touch 2G provides the ultimate in low-profile protection with less than 1mm in thickness. The color versions of the MicroShell have a beautiful metallic look with a smooth rubberized finish. 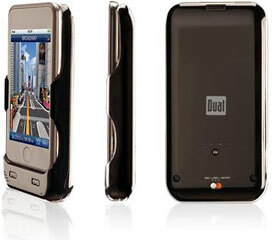 The clear version is ideal for showcasing the iPod touch 2G. This sleek, ultra-slim half-shell case is perfect for protecting the iPod touch in a pocket. Marware Inc, designer and manufacturer of innovative products for the Apple market, today announced the MicroShell for the iPod touch 2G is now shipping. This sleek, ultra-slim half-shell case is perfect for protecting the iPod touch in a pocket. The MicroShell works as an additional layer of protection when used in conjunction with most fabric clip case solutions. The colors boast a beautiful metallic finish that is smooth to the touch, while the clear version is completely unobtrusive and ideal for showcasing the full beauty of the touch. 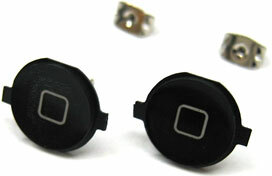 The MicroShell is available in black, clear, red, blue, and pink. The MicroShell also comes with Marware's Lifetime Warranty. The MicroShell for iPod touch 2G is available black, clear, red, blue, and pink. It retails for $24.99 USD and is now shipping. Please visit Marware online for more information. Marware is a leading provider of software and eco-conscious accessory solutions for Apple iPhones, iPods, and Notebooks. PR: Marware Inc. has announced the SportShell Convertible for the iPod nano 5G is now shipping. The SportShell Convertible works as an armband case, a clip case, or a smooth pocket case with no clip. By using interchangeable parts, the SportShell Convertible offers you a full range of carrying options (armband, pocket, and clip case) without sacrificing form, functionality, or looks. The clip system allows you to fasten your nano to the armband, waistband, purse, strap, or pocket - effortlessly. Change the back piece and use the clear, flat back with no clip. Just put the case in your pocket or bag. This case is rugged, versatile, and the clear shell lets you show off your new colorful nano in style. The SportShell Convertible also comes with Marware's Lifetime Warranty. The SportShell Convertible for iPod nano 5G is available in clear, retails for $34.99 and is shipping now. Please visit Marware online for additional information. Marware is a leading provider of software and eco-consious accessory solutions for Apple iPhones, iPods, and Notebooks. PR: Marware Inc, designer and manufacturer of innovative products for the Apple market announces the Eco-Runner for the iPod nano 5G is now shipping. The Eco-Runner for nano 5G is made from Eco-Prene and is an environmentally friendly case for the eco-conscious jogger or exercise enthusiast. The unique design details look like muscle fibers when you wear it. The armband extension strap allows this case to be worn on your wrist or upper arm, and a bottom adjustable strap allows room for the Nike + Sport Kit receiver. The Eco-Runner is available in black, blue and pink Eco-Prene. Eco-Prene is made from innovative sponge-like limestone. This is combined with recycled rPET to create an end result which looks and feels like neoprene, only far less toxic and more sustainable because it doesn't contain high levels of petroleum or PVC. This material meets all RoHS standards, and all adhesives used in this product are non-toxic. The Eco-Runner keeps your nano secure while providing comfort for an active day, all the while reducing your carbon footprint. The Eco-Runner is made of eco-friendly materials and is available in black, blue and pink. It retails for $34.99 and is now shipping. Please visit Marware online for more information. Marware is a leading provider of software and eco-conscious accessory solutions for Apple iPhones, iPods, and Notebooks.